Do you use infographics to engage and share? So you have seen them, the creative diagrams that tell a story, splattered on social media channels, highlighting a topic or fact for a brand? Maybe you are thinking about creating an infographic for your company but aren’t sure where to start or a topic to focus on? I can help you with that. Creating infographics is just one of the greatest joys of what I love to do. Simply put, infographics visually tell a story in eye bite pieces. They are fun to learn from and to share with others. The list of benefits of why infographics help your business goes on and on. There are many articles, from The Huffington Post to Forbes, describing the vast benefits of infographics including social media exposure as well as added SEO. In this post, I will focus on a few things to think about when you are creating yours. In fact, there are four examples of infographics that I created, displayed below, to show how differently a graphic can be constructed. Let’s start with best practices. I personally create all my infographics in Illustrator. I find that a vector is the best way to create graphics properly and will save sizing and production headaches in the long run. Vectors are scalable, so they can easily be reconfigured for different sizes as well as media requirements. Think about multiplatform distribution. Will the graphic be printed or just used for digital distribution? What size will have the best resolution so that it can be customized per channel without having it be recreated each time? Think about legibility. Are you leaving enough white space? Are things properly aligned to help with flow? How is color used within your brand requirements? How does the style of the graphic mix with your brand standards? Is your typography heirachy clean and legible at various sizes. How does it all translate from desktop to mobile? Simplify your data visualization. Is the graphic something that is easily digestible? It’s great to show a complex graphic but if it is hard to understand, I think you are missing your point and the opporunity to engage your customer. Think about the length. If it is too long, the audience may miss your call to action way, way down at the bottom of the page. Your audience may give up after one click and will click away if they have to scroll too far. If you do find yourself with a super long graphic, maybe break them up into multiple graphics and distribute as a series. Think about different the uses. Yes, infographics are great for social media but they can also be used for presentations, within an eBook, a part of a blog post, a traditional ad or even a direct mail piece. Partner collaboration. Is there a company that you are working closely with? Maybe there is an opportuity to let your customers know of how the benefits of that partnerships trickles down to them. It will increase your exposure by not only going out to your audience but to your partner audience as well. Repurposing existing content. Why not take that information in a white paper and summarize it in an infographic? This is where you might find that you will have a better response from that white paper content. You will be able to see if there is a difference in response, by tracking the numbers. Also, with the internet being a vast array of content, it is ok to revisit something that was created 6 to 8 months ago. Not all of your audience may have seen it the first time, so publishing it again, in a different format, may be seen with fresh eyes. Let a new personality of your brand shine. Try a different graphic style. Add to your corporate color palette. Add a funky typeface, that is outside the norm, but helps with getting your message across in a stylistic way. Infographics are supposed to be fun and informative, so you should have fun when creating them! I do hope this helps with thinking about different ways to talk to your audience. Below are just a few examples of some recent infographics that I have recently completed. 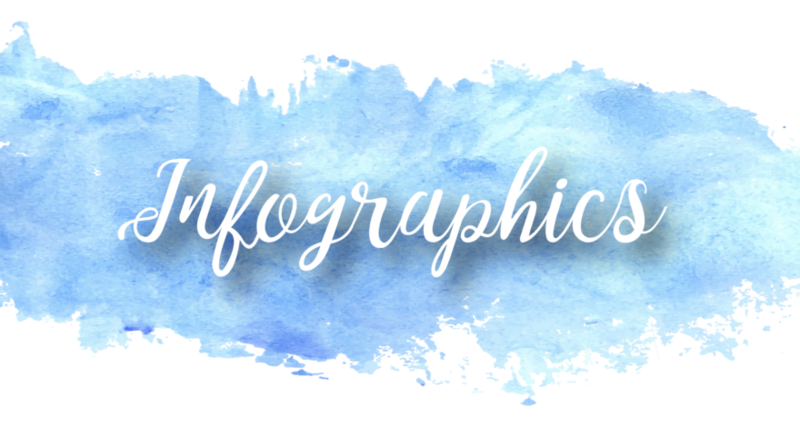 If you are interested in learning more or working with me to create your next infographic, lets talk!